The Charles Dickens Museum in London is located at 48 Doughty Street, in the former home of the author. During his time here he wrote some of The Pickwick Papers, Oliver Twist, Nicholas Nickleby and Barnaby Rudge. For any fan of Dickens it is definitely a must if you are visiting London but is also interesting for people who aren’t as familiar with his work. Unfortunately when I went to the museum in late June 2011 a lot of the contents were not there; they were part of an exhibition that was visiting France. However, I still thoroughly enjoyed walking around within the walls of the house that had once contained Charles Dickens himself. First of all we were directed downstairs into what had once been the kitchen but now contained hundreds of different editions of all of Dickens’ novels and stories. There were some really beautiful books in there. We then watched a short film about the author’s life and times, all of which I was already familiar with having been a fan since I was 14 years old. For people, such as my brother, who was with me and didn’t know much about Dickens this is a great way to get a quick overview of his life and career. With this fresh in our minds we then proceeded to the upper most floor of exhibition rooms and worked our way back down, seeing the entire museum. The original painting of Dickens’ Dream by Robert W. Buss which remains unfinished due to the artists’ death in 1875. It is a wonderful image of Dickens dozing in his chair at Gad’s Hill while his many characters occupy his dreams. The fact that it was never finished adds to its charm I think and I couldn’t resist buying a poster of a copy to hang on my own wall. The Garret Window is a small window that hangs on the wall in the museum. It was removed from the attic of the house in Bayham Street where the Dickens family lived in 1823 when Dickens was 11 years old. It is from his bedroom and anyone who has read David Copperfield can’t help but look at it and imagine a young Charles Dickens staring out of it cooking up wild stories to escape his less than happy life at the time of his residence in Bayham Street. 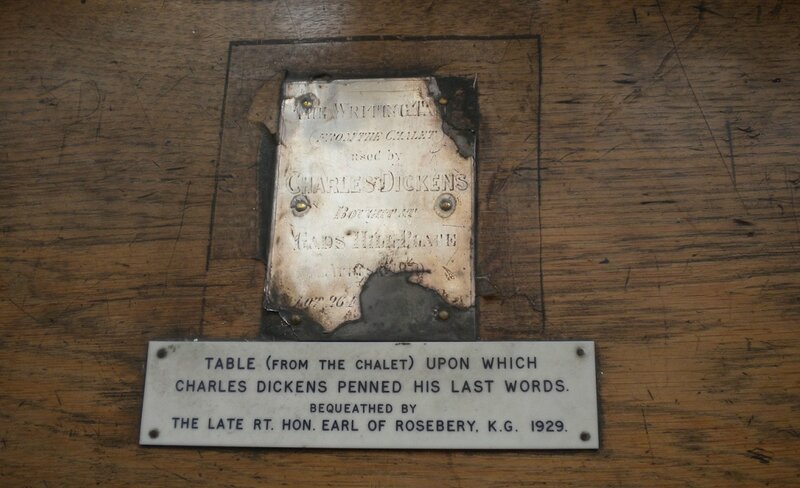 The desk from his Swiss Chalet which Dickens used to write his last words upon is also there to see and touch. The Chalet itself can be seen in Rochester, east of London in Kent (which is also worth a visit if you are heading that way). Other items which I enjoyed were the armchair that Dickens sat in to have the famous portrait by George Cruikshank painted in 1837, a desk and chair he used when working as a legal clerk for Ellis and Blackmore, portraits of Charles and his wife Catherine from 1838, originals of the Nicholas Nickleby serial and the earliest known portrait of the author. The museum is definitely one of the best I’ve been to and I enjoyed my visit immensely. The large amount of personal artefacts belonging to Dickens and his family and the very helpful and approachable guides make it well worth the £9 entry fee. I would recommend it to anyone who has an interest in Charles Dickens as well as anyone who enjoys 19th century literature and history. If I was ever in London again, which I hope I will be at some time, I would certainly revisit the museum. Let us know if you've been to the Charles Dickens Museum and what you loved most about it. If you haven't been, what's your favourite museum?